To examine if parent illness uncertainty is indirectly associated with child depression, anxiety, and HRQOL in the CKD/SLE population. Parent–child dyads (N = 31) from outpatient rheumatology and nephrology clinics included children (ages 9–18) diagnosed with CKD (Stage 1, 2, or nephrotic syndrome) or SLE. Parents completed demographic and uncertainty measures and children completed uncertainty, depression, anxiety, and HRQOL measures. This cross-sectional study examined mediational models using the percentile bootstrapping method. Parent uncertainty had an indirect effect on child depression, anxiety, and HRQOL through the mediator, child uncertainty. 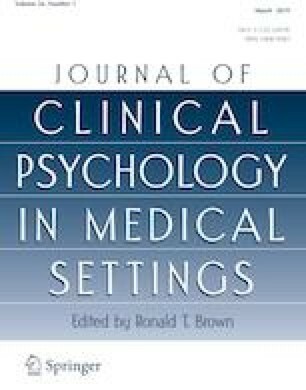 In other words, parents’ illness uncertainty regarding their child’s condition correlates to the child’s illness uncertainty, which then is associated with the child’s mental health and wellbeing. Reverse mediations illustrated that parent uncertainty did not mediate child uncertainty and outcome variables. Results extend previous research by examining parent and child illness uncertainty in understudied conditions (CKD/SLE) and the relationship to outcome variables commonly related to depression (e.g., anxiety and HRQOL). Findings allow health psychologists and medical personnel to understand the impact of uncertainty on the child’s wellbeing and HRQOL. Clinical implications, including using specialized interventions to address illness uncertainty, are discussed. Jennifer L. Petrongolo, Nataliya Zelikovsky, Rachel M. Keegan, Susan L. Furth, and Andrea Knight declare that they have no conflict of interest. Informed consent and/or child assent was obtained from all individual participants included in this study. American College of Rheumatology. (2012). Systemic lupus erythematosus in children and teens. Retrieved from https://www.rheumatology.org/Practice/Clinical/Patients/Diseases_And_Conditions/Systemic_Lupus_Erythematosus_in_Children_and_Teens/. American Kidney Fund. (2015). Nephrotic syndrome in children. Rockville, MD. Retrieved from http://www.kidneyfund.org/kidney-problems/nephrotic-syndrome/nephrotic-syndrome-in-children/. Center for Disease Control and Prevention. (2016). Health-related quality of life (HRQOL). Retrieved from https://www.cdc.gov/hrqol/. Hayes, A. (2012). PROCESS: A versatile computational tool for observed variable mediation, moderation, and conditional process modeling [Statistical program]. Retrieved from http://www.afhayes.com/public/process2012.pdf. Heath, J., MacKinlay, D., Watson, A.R., Hames, A., Wirz, L., Scott, S., …, McHugh, K. (2010). Self-reported quality of life in children and young people with chronic kidney disease. Pediatric Nephrology, 26(5). 767–773. https://doi.org/10.1007/s00467-011-1784. National Kidney Foundation (2017a). About Chronic Kidney Disease. Retrieved from https://www.kidney.org/kidneydisease/aboutckd. National Kidney Foundation. (2017b). Nephrotic Syndrome. Retrieved from https://www.kidney.org/atoz/content/nephrotic. Paz, Z., & Watcher, S. (2017). Systemic lupus erythematosus (Juvenile). The American College of Rheumatology. Retrieved from http://www.rheumatology.org/Practice/Clinical/Patients/Disease_And_Conditions/Systemic_Lupus_Erythematosus_in_Children_and_Teens. PROMIS. (2014). PROMIS pediatric profile instruments. Retrieved from https://www.assessmentcenter.net/Manuals.aspx. The Renal Association. (2018). Identifying patients with CKD stages G1 & G2. Retrieved from https://renal.org/information-resources/the-uk-eckd-guide/stages-1-2-ckd/. Tunnicliffe, D., Singh-Grewal, D., Chaitow, J., Mackie, F., Manolios, N., Lin, M., …, Tong, A. (2016). Lupus means sacrifices: Perspectives of adolescents and young adults with Systemic Lupus Erythematosus. Arthritis Care and Research, 68(6), 828–837. https://doi.org/10.1002/acr.22749. Varni, J. W., Magnus, B., Stucky, B. D., Liu, Y., Quin, H., Thissen, D., …, DeWalt, D. A. (2014). Psychometric properties of the PROMIS® pediatric scales: Precision, stability, and comparison of different scoring and administration options. Quality of Life Research, 23, 1233–1243. https://doi.org/10.1007/s11136-013-0544-0.